But Today!! In Stock Now!! 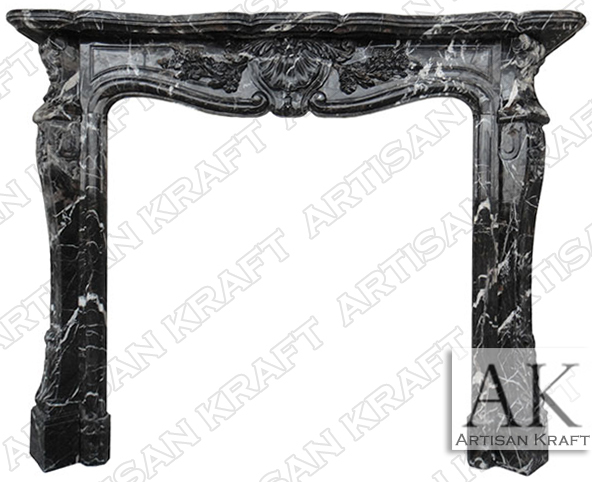 St. Louis Nero Marquina black marble fireplace is an unapologetically French style mantel. This particular design dates all the way back to the Palace of Versailles where it can be viewed in a vast array. This is a reproduction of an antique mantel surround straight from France. Floral carvings decorate the legs and frieze while a shell splits the mirrored image in half. The hearth can be made from a different stone such as white to provide a lot of contrast. A beautiful black stone with white veining. This model is part of our unique Antique Collection and is sometimes available in stock. To get the real details and beauty of this surround we would recommend using polished marble. View other sale fireplace mantels. To request custom sizes please use the enquire about this product tab to submit opening dimensions. Fireplaces are available in standard dimensions based on the opening/firebox size. All dimensions are customizable if standard dimensions do not work. Order any fireplace model to your exact specifications.